Concluding the last couple of week's summer fun activities with a toddler, today we have some indoor ideas to entertain your little one on those days when it's just too hot or it's rainy or you just need to stay home and get things done. We go to the playground almost every day, especially now that I've discovered a small, enclosed playground near us that allows me to sit rather than chase Eli all over. The one we used to go to is awesome, but it's just so big and there are a lot of big kids that I have to steer Eli clear of as they often aren't aware of his little self in their path. For those days when we don't make it out though, here's what we like to do. I had seen this awhile back on Pinterest (where I find most of my ideas of course) and had tried it when Elliot was about a year old and while he was kind of interested, he wasn't totally into it. A few weeks ago however, it was pouring, so my friend Jenelle and her daughter Evelyn came over and we tried moon sand again. This time, it was a hit! I threw in some measuring cups, plastic spoons, washed yogurt containers and toy cars and let the kids go to town. Moon sand is easy to make and the results are a soft "sand" that can be molded like regular, wet sand. Clean up is easy, especially if you keep things covered well. Just gather up the tarp/sheet/whatever you're using and shake it off outside. Whatever is left in the bowl or container you used can be wrapped up and reused for a week or so for continued entertainment when you need to get things done. 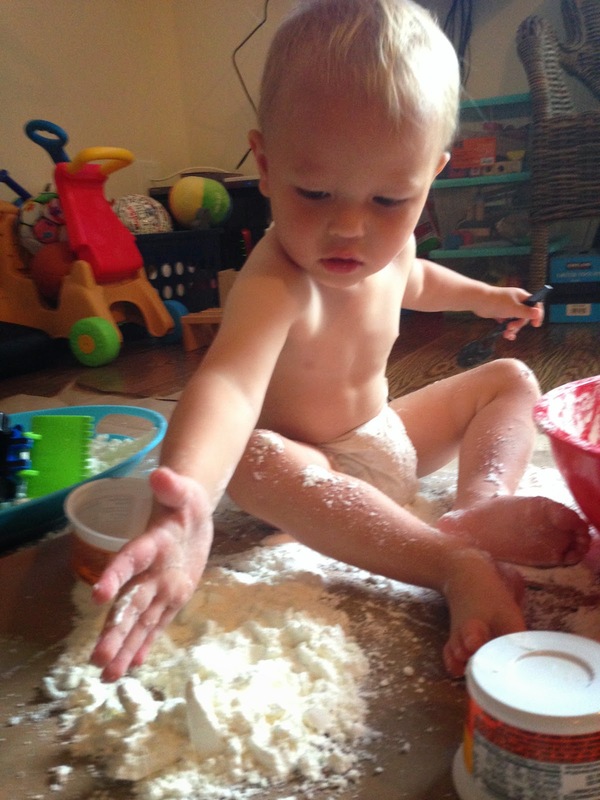 To make Moon Sand, mix together 8 cups flour + 1 cup baby oil. Also on that same day, we made oatmeal dough. This wasn't as popular with our one-and-a-half year olds. It was sort of like play dough, you could mold it into shapes and things, but they didn't quite get that concept. I got the idea from these cards my aunt gave me with activities to do with one year olds. If your child is a little older though and you don't have play dough on hand, mix this up and you're good to go. Unlike the Moon Sand, don't leave this out unless you want furry things to grow. I wouldn't know anything about this of course....don't be like me. Pop it in the fridge if you want to reuse it. To make Oatmeal Dough, mix together 2 cups dry oatmeal + 1 cup flour + 3/4 cup water. Similar to Moon Sand, Magic Snow is a mixture of cornstarch and shaving cream. I got the idea from, where else, Pinterest. The "snow" can be molded into different shapes using whatever containers you have on hand, which in our case, is yogurt containers. You could try and actually make a snow castle or something, or if your kid is like mine, you can just smash whatever form you made and think it's the greatest thing ever. This was a bit more messy than moon sand, but it vacuums well and wipes up super easy. The extra clean up is worth the 30 minutes this buys me to do whatever I need to do. To make snow, mix together 2 boxes of corn starch + 1 can of shaving cream. This idea was also from the cards my aunt gave me. This is a great activity to combine with the oatmeal dough because you can use the leftover oatmeal container to create your masterpieces. Grab some paint, a small ball (we used golf balls which made cool dimples on the page) and a box or cylindrical shaped container that can be sealed shut. Dip the ball in the paint so that is fully coated. Line your box or cylinder with a piece of paper, making sure that it won't slide around. Drop the ball in the box, seal the lid, shake like crazy and voila! Art. It took awhile for Eli to get what we were doing, but after a bit he figured it out and did his best to shake the ball around. I would imagine in a few months, he will really love doing this. We did this awhile back when we were moving and had a bunch of water bottles lying around. I just set them up like bowling pins, grabbed a soccer ball and encouraged Eli to roll the ball and knock the "pins" over. Simple, fun and, best of all, no clean up (besides putting the bottles away of course). 1. Play ball--shooting baskets on the Little Tikes hoop (or into a laundry basket if you don't have a hoop), kicking the beach ball around, tossing the beach ball up in the air and trying to hit the ceiling, indoor "putt putt" (we have a little plastic golf set but you could get creative with this one), just grab any indoor safe ball and have fun with it! 2. Pretend to be animals--crawl around and say "let's pretend we are ______" fill in the blank with whatever animal you are feeling like at the moment (lions, sheep, dogs, elephants) and then make that animal's sound. You will feel silly but the joy on your kid's face is totally worth it. Great imaginative play as well as learning different animal sounds. Bonus: crawling is a great workout for the triceps! It's rough on the knees though so maybe do this on carpet. 3. Dress up--Eli is at a stage where he is really into getting himself dressed. He will grab whatever piece of clothing he finds--t-shirts, shorts, Dad's underwear, Mom's underwear--and try to put it on. I love this for when I'm folding laundry. I make it very clear that he is not allowed to touch anything that has been folded but that everything in the unfolded pile is fair game. He grabs his clothing of choice and tries his best to get it on. I get things done, and I get free entertainment and lots of laughs while folding clothes! Win win all around. 4. Clean! Strange I know, but little ones are surprisingly really into cleaning and being helpful. If it doesn't scare your child, chase them around while you vacuum. Eli loves being chased by the vacuum and even asks to vacuum now. Give them a rag and have them wipe along side you while you mop or hand them a dust pan and small brush to "wipe" up any crumbs they see. I've been surprised by what I can get done with Eli at my feet if I make it fun and involve him. 5. Air Mattresses--Maybe you don't have one on hand, but if you do, bust it out one day and let your kid play on it. Eli loves whenever we blow them up or take them down, and he especially loves crawling on them when they are up and filled with air. I always know when I have to get ready for guests to come that I will at least get the air beds up and made because he loves the whole experience so much! That's all that comes to mind right now of ways I keep my active boy entertained and myself sane when we are cooped up at home. There are so many ideas out there, much more creative ideas than I have here. Just scour the internet, mostly Pinterest, and find what works for you and your kid. Happy playing!